Due to Emergency the contents of this page is shifted bottom. The Earth will be blown up by the scum, who call themselves as scientists. Society you are a stupid cattle - because, despite the existence of this and similar web-sites, you did nothing for the detention of terrorists, physicists from CERN and other scoundrels, sitting in academies and promoting this blasphemous experiment. These are triads, which can be made of up, down and strange quarks. One of these triads is stable in isolated state; it is a proton, uud. All other triads are more massive than proton (uud), as a result, they all decay. It is known, that the triad udd, which is neutron, decays, if it is isolated. The cause of decay is clear; - the mass of free neutron is bigger than the mass of free proton. 3. inside the neutron-deficit nuclei a proton decays at neutron, positron, electron neutrino. This shows us, that sometime a triad udd can be more stable than uud triad. Now we can make a conclusion: stability of a quark triad depends on the properties of a subnuclear condensate. The question arises, - is there a subnuclear condensate, where some quark triads be more stable as usual proton-neutron condensate, which are the nuclei of our Earth? 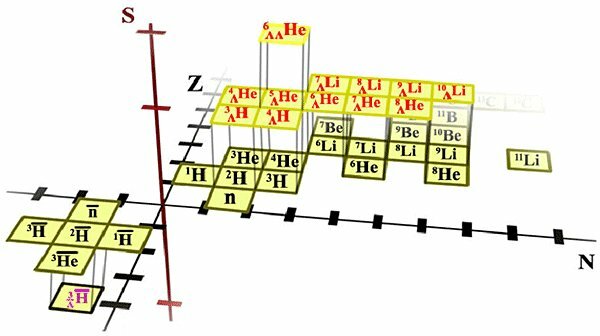 Till now physicists had received unstable nuclei, consisting from three types of triads: protons (uud), neutrons (udd), and lambda-hyperons (uds). Till now physicists had received even an anti-hyper-hydrogen, which is also unstable. But look at the beginning of this text, and try to understand, when unstable free neutron becomes more stable than proton, if neutron is not already free, but bonded in subnuclear condensate. Try to answer, what will happen with the ordinary matter, if physicists will create a stable condensate of lambda-hyperons, or of a mixture of neutrons and lambda-hyperons. These subnuclear condensates have no limit of grows. Usual subnuclear condensate, consisting of protons and neutrons, do, have the limit, which is uranium. Uranium finishes the periodic table of stable elements. The existence or absence of the limit is explained by the electrical charge of a condensate. Usual nuclei have an electrical charge. Condensates, made of lambda-hyperons and/or neutrons, do not have the electrical charge. As a result, they do not have Columbian barrier, which do not let the ordinary nuclei to fuse. The 9-th of November 2010 CERN plans to collide heavy ions. As a result, the Solar system can be exploded into a nova star. If strangelets will capture ordinary nucleons, ruin them and grow without decay on smaller strangelets, then the duration of explosion will be about of 500-1000 days. If growing strangelets at some moment would decay at smaller strangelets, then the duration of Earth explosion can be much less. There are some other microscopic condensates, which can be created at LHC, for example, microscopic magnetic holes. Result of such experimental discovery will be the same – the Earth’s explosion. Heavy ion collision is a new dangerous step, planned by CERN physicists. They will be started in two months. Politicians, businessmen, ordinary people believe that “the best physicist” on the planet are correct. CERN propaganda had made its criminal role; - courts, switched on by opponents of dangerous CERN’s experiments, are failed. So, people, be ready to be murdered. You did not believe us earlier, you do not believe us now. You a lazy to ruin the CERN, you are lazy to strike in order to save yourself. You are a crowd of silent cattle, which must be killed. I wish you happy flight in icy comets to other star systems. Go and bring there a seeds of new life. Do not fear to die, and fulfill your sacred mission. Fasten your safety belts; - be ready to suicidal reproduction of biospheres. September 7, 2010. From my point of view, the most dangerous things, which can be made on proton-proton (p-p) collisions at powerful colliders, are two different condensates: microscopic magnetic holes and microscopic droplets of strange matter. In the bottom I’ll name both of them by unifying term “droplets’. I have made a program "Explosion of the Earth, switched by criminal physicists" and want to show you some results. The time interval of the Earth explosion depends from several parameters: the number of created droplets; the density of matter inside droplets; the velocity of particles in plasma bubbles around the droplets. Let velocity of particles in the plasma bubbles will be v=c/10. c. if there were created 1 droplet, then the Earth will be exploded in 75 years. Result "c" can be rejected. Physicist will not stop if they will see one unusual track. Result "a" can also be rejected, because it is impossible to create 100 000 000 000 droplets in the very first days. In the upper results we supposed that the droplets were made simultaneously. d. 1 droplet per 100 seconds. As we know LHC works with quite long stops. So, I think, that the option "d" is the most reliable. As a result, I supposed that the total time of Earth explosion into fragments is about 1000 days. 1. The mass of Earth’s matter, ruined before the rest of it would start into cosmos with velocity about 10 km/s, is about 1015 kg, - that is about one billionth part of Earth. That also will be approximately the total mass of all droplets. 2. The Sun will be ruined in about a 1000 years. The Sun will undergo several successive explosions as nova. 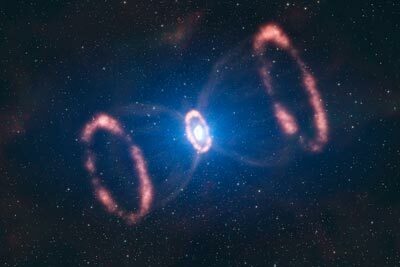 By the way, that explains the rings of SN 1987A. 3. The energy output of matter’s collapse at droplets at the time of “Earth torn on peaces” will be about the luminosity of the Sun. That means that neutrino flux from the Earth at that time will be by (R/r)2 times bigger than today’s neutrino flux from the Sun. (R – radius of Earths orbit; r – radius of the Earth). The graph of heat power in the “continuously” case is a cubic parabola; consequently, we are able to register the excessive flux of neutrino from the Earth already now! If there is no such excessive flux, then I was wrong. But do not forget about future ion-ion collisions; do not forget about future 2*7 TeV p-p collisions. Those are other possibilities to kill the Earth, to kill the humankind. 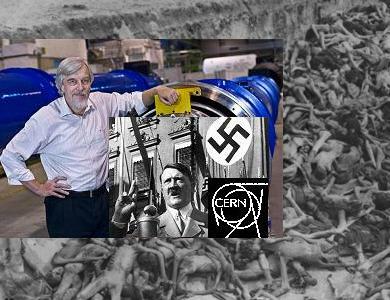 CERN and all corrupted science are responsible for the probable future murder of 6 billion people and probable destruction of the Earth. It was subscribed in the Universal Genetic Code of Eternal Living Universe that we, the enemies of biosphere's suicidal reproduction must be undergone to ban, to laughter and shame; otherwise the reproducing act would not occur. That is the law of biosphere's reproduction. So, don’t fear to die and perform your sacred mission. Fasten your safety belts; - be ready to biosphere’s suicidal reproduction! Appendix: If you do not trust to my computed results, you can compose your own program and test it. My program works by small steps, measured by time interval, for example, dt=1000 seconds. At every step it computes the number of ruined protons by this formula dN = dt v 4pr(i)2k / 6, where v = c/10, c – velocity of light; 4pr(i)2 – the surface of a droplet at i-th step; r(i) – radius of a droplet at i–th step; k – concentration of protons in a plasma bubble around a droplet, k = MEarth/((4/3)pREarth3) / mproton. The number “6” in a formula for dN is explained by the fact that our space has 3 dimensions and by the fact that only 1/2 of particles move in positive direction. Radius of a droplet at the next step: r(i) = r(i - 1)((N + dN) / N)1/3. The total number of ruined protons at every step: N = N + dN. P(i) = dN * mprotonc2 / dt / 2 * Ndr. Ndr – number of droplets created per step. The program stops, when the total heat output, Q, becomes bigger than 3*1032 Wt. This amount of energy is enough to send all matter of the Earth to infinity. Inevitable energy losses can be neglected if T < 1000 days. If T > 1000, then the true value of T will be the more, the more it’s computed value. Note 1. It was supposed that every proton, p, colliding with microscopic magnetic hole, NS, decays and the droplet becomes bigger. NSn + p = NSn+1 + e+, where: e+ - positron; subscripts n and n+1 are the number of x-bosons in the magnetic hole; x-boson is a smallest magnetic excitation in ferromagnetic Savidy vacuum, ns. As a result of proton capture the region around magnetic hole will have an excess of neutrons. That will lead to beta decays and to flux of electronic antineutrino from that region. Note 2. It was supposed that every proton, p(uud), and every neutron, n(udd), colliding with droplet of strange matter, N(uds), decays and droplet becomes bigger. N(uds) + p(uud) = (N+1)(uds) + K+, where: K+ - positively charged kaon. (N) and (N+1) are the number of lambla-hyperons in a growing strangelet. Lambla-hyperon is a strange nucleon (uds) in a strangelet N(uds). A strangelet can capture neutrons too: N(uds) + n(udd) = (N+1)(uds) + K0, where: K0 - neutral kaon. K+ and K0 decay. As a result an additional flux of different sorts of neutrino and antineutrino can be registered. Every capture of nucleon by a droplet is accompanied by heat output of about half of rest energy of nucleon. That means that the binding energy of a droplet is extremely high; that specific energy output of nucleon collapse onto droplet is hundred times more than the specific energy output in uranium or hydrogen bombs. But the time interval of collaptical explosion is quite big, because, in order to explode the Earth into peaces, the droplets must successively grow from 10-23 kg to 1015 kg / Ndr. To read more on this topic open the page Collider, News, Links. and CERN faces €250m budget cuts and my recent commentaries to those articles. April 2, 2010. 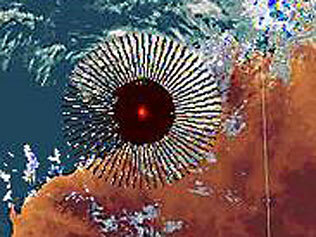 Look at the patterns at the page Bureau of Meteorology images show mysterious patterns on radar system. March 30, 2010. Crime had happened. Collisions with the energy 3.5 TeV per proton or 7 TeV per collision were performed. March 19, 2010. Today night the criminals from CERN accelerated protons to the record energy 3.5 TeV per beam. At the regions of collisions, probably, the rays were on skew lines (two lines that do not intersect but are not parallel). It is not excluded that there were accidental collisions of protons. If the collapse was switched, then most probably tomorrow morning all people will start to cosmos. 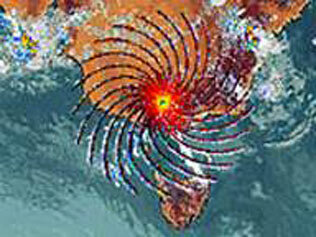 According to plan the first collisions at 3.5 TeV must be fulfilled the 30-th of March. March 10, 2010. By the way, it seems, unstable condensates were already been created at Tevetron. That follows from the multimuon events (up to 8 per droplet and antidroplet) described at the end of 2008 by CDF collaboration. From the other hand, some authors say that "strange condensate" is stable if it has more than 10 lambdas, 10(uds). Here is a figure from one Russian-language page about those events. c) – Abnormal events. I would change the signs “?” by “N(usd)” and “N(usd)”. ...This portrait is dedicated to CERN decision to start collider work the 20-th of February with energies 3.5 TeV per proton. Let’s speak about “Hawking radiation”. Bell paradox. If two rockets, connected by a string,..
... This is not my picture. Perhaps its author is my good friend, supporter. Citizens! Do not think that some good Uncle Ivan would come and destroy the CERN and its doomsday machine, LHC. Think yourself for your salvation. And not just think, but act. 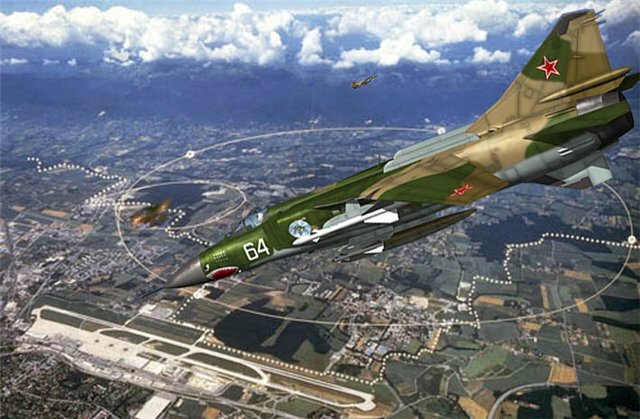 I have no flight experience, no money for the fighter and for a nuclear warhead to bomb the LHC. If you will not stop the CERN now, the CERN will kill all of you in the first quarter of this year, with the probability of about 50%. Proton-proton collision, which leads to creation of stable excitation of physical vacuum, can look like this inelastic collision. ... In the ordinary vacuum different virtual particles constantly appear and disappear. In the bottom figure we can see the appearance of electro-positron pair in the point A and their annihilation in the point B. In order to transform virtual pair into real pair we must spent energy. On the next figure we can see the x-boson, consisting from two fermions, particle and antiparticle. If the energy of p-p collision at collider is sufficient we can create an exited region in vacuum containing some quantity of such x-bosons. They are oriented in the same direction and have the superconductive and ferromagnetic properties. The end of extremely urgent note. upper of this radius the particles have average thermal velocity smaller then the orbital velocity. If there were no particles having the speed below of orbital, then gas sphere would simply scattered. (It is the answer why there is no atmosphere on the Moon). At the radiuses more than r, the molecules have average thermal velocities less than the orbital velocity for this radius and as a result, “they press" downward on the border between layers. At the radiuses less than r, the molecules have the larger velocities than the orbital velocity for this radius, and as a result, "they press" upward on border between layers. It means, that the pressure of gas grows up when we move deep into the object only to some radius r, and when we cross this radius, the pressure begins to decrease; and when we move nearer and nearer to the center, the pressure becomes less and less. In addition to figures shown on the page the GTC Description, below there are the figures, called to help to understand the reason of occurrence of Gravigeometrical Paradox. Even the fantastic black holes should be less dense at their centers, in comparison with the density at some radius r from their centers. By the way, there are only few solutions of the GRT equations, describing the interior of massive objects. The only such objects are the objects with constant density everywhere inside. The falsification of “black hole lovers" is opened simply. At the beginning of their theories they take the erroneous assumption that the black hole is made of an incompressible liquid with the constant density everywhere. They can be understood, it is impossible to solve the GRT equations in another way. But you see that this assumption is false. We should deduce the law of distribution of pressure and density in object, instead of development of the false preconditions in the base of the theory. Well, black holes are fairy tales; and we shall leave them in rest. We can see, that in astrophysics it is possible to be engaged in a juggling and to build the false theories on the unsteady base. The other, much more essential juggling is a statement about the greatest density and pressure at the centers of stars. This juggling was necessary "to start" the thermonuclear reactions as the source of star energy. And as we already have understood, what is the true source of energy of stars; this juggling about high density and pressure in the depths of stars is not necessary any more. But the truth is necessary. In gas object the particles move along the complex trajectories. At first let’s assume, that between particles there occur the elastic collisions; and particles are simply interchanged the position and they will continue their movement along the trajectories of those particles with which have collide. - What trajectories of particles will be? - No. The ellipses would be only in the case, then all the mass of the object would be concentrated at the center, and some probe particles would fly around of this center and draw the ellipses. Though, for the beginning I’ll give “the black hole lovers” a start: let particles fly by ellipses. Even in this case the paradox works. At investigation of true trajectories, the paradox works more expressively, but its investigation is more difficult. So, particles move on sections of curved lines, forming thus a set of ellipses. There are no straight sections, or they are very few. There are only pieces of circles and of ellipses. On the bottom figure there are two ellipses, red and blue. These ellipses cross an external circle under the same angle. Let's consider also two concentric circles (spheres) of radius r and r-dr. Let two particles will be closed between these spheres, that is, they collide with the same particles in points, laying on these concentric spheres, and consequently, come back into the space, closed by these spheres. One particle, which we shall name “cold”, moves by the sections of a blue (cold) ellipse, and another particle moves by the sections of a red (hot) ellipse. So, the "hot" particles transfer a greater momentum outside, than inside, and the "cold" particles - on the contrary. Accordingly, the pressure of "hot" gas grows as we move from the center, and the pressure of "cold" gas grows as we move to the center of the object. The concepts "cold" and "hot" in this case is not determined by any value of gas temperature. Thus, for any temperature and for any object with certain mass it is possible to find such radius, that below of which we name the gas as “hot”, and above which we name the same gas as “cold”. Actually the external layers of any massive objects are colder than the internal layers of the object. Thus, it is possible to consider the external layers as "cold" layers, and the internal layers as "hot" ones. As soon as we shall find the radius at which the gas is considered as not "cold" and not "hot", that will be the radius, at which expected density and pressure are close to maximal. There are some reasons, on which the radius of sphere of the maximal pressure, the radius of sphere of maximal density, and the radius of sphere of "normal" gas a little bit differ from each other. We shall not try to penetrate into these labyrinths now. On the bottom there is one more paradoxical figure. If we shall project an ellipse from a plane xOy, on a ray Or, we shall notice, that in any ellipse there is a zone, where the acceleration d2r/dt2 is directed from the center of an object; and there is an area where this acceleration d2r/dt2 is directed to the center of object. And it is known, that the force is proportional and directed in the same direction as acceleration. That means, that inside of any object and for any ellipse there is an area, where the gravitational force is directed to the center, and there is an area, where the gravitational force is directed outside from the center. But whether it is necessary now to name this force as "gravitational" force? Knowing the direction of acceleration, this ellipse can be divided on "cold" and "hot" areas. The particle moving along the cold section of the ellipse, presses downwards, and the particle moving along the hot section of the ellipse, presses upwards, devastating thus central areas of the object, and forcing pressure in some zone of the maximal pressure, located at some distance r from the center of the object.